We all have a favourite recipe, but why not try these. I’m certain you’ll like them. If I don’t eat them all right now, I’ll be sharing at work tomorrow. In a bowl combine the flour, baking soda, baking powder, and salt. In your mixer beat the butter, granulated sugar, and brown sugar until creamy. Add the eggs one at a time, beating well after each addition. Add the vanilla. At this point, I take the bowl out of the mixer and stir the dry ingredients in by hand with a big wooden spoon. Once you are happy with your efforts, stir in the chocolate. Depending on the temperature of everything, you may want to put the dough in the fridge (under saran wrap) for a bit to chill it. 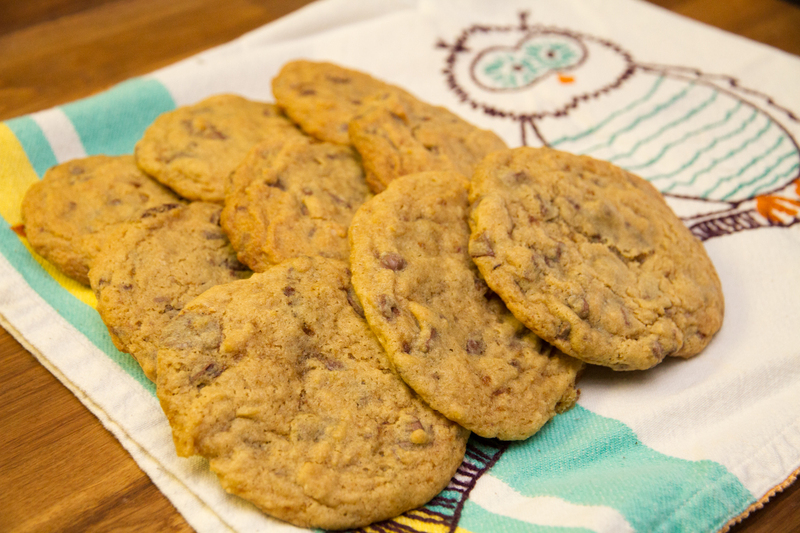 Scoop out as much dough as you want -make giant cookies if you want – and place accordingly on the baking sheets. Bake for 12-20 minutes depending on the size. Remove the pans and cool for a few minutes before removing to wire racks or your mouth.